Vinyl windows are one of the top upgrades to make to your Calgary home. Vinyl windows withstand the harsh Calgary winters, so they don't warp as a result of temperature extremes, and they don't rot from water damage. They also don't to be painted or sealed to keep them protected. Windows are heavy, and trying to lift them and fit them into place can be a real chore. Even if you are working with someone else to place the windows, you still put yourself at risk of making a misstep and dropping the window. The best-case scenario is that you drop the window and it doesn't hit anything else besides the ground. You're out the money for the window but nothing else. The worst-case scenario is that the window crashes on top of you and seriously injures or even kills you. Hiring a professional ensures your safety and the safety of your home. Professionals are also insured against any accidents causing personal or property damage. You might watch dozens of YouTube videos and follow the manufacturer's instructions to the letter (or so you think), but as a novice, you can still easily make a mistake with the installation. You may not even know it until your windows or your home becomes damaged. By working with a professional, you ensure that the job is done right. You can take advantage of the full energy savings that vinyl windows provide, and you can ensure your home is protected. In some cases, installing your own vinyl windows could void the warranty on them. Some manufacturers may require that you hire a professional to get the warranty, which could be up to 50 years or more. Check with the manufacturer to verify the details. Vinyl windows installation does not have to be expensive. 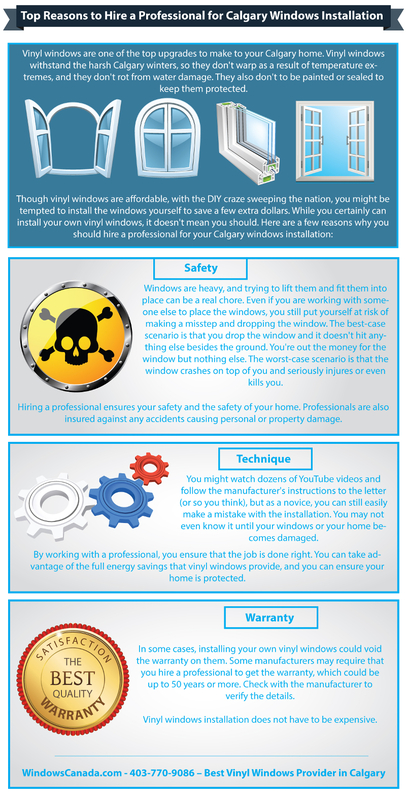 Click here to find cheap offers for windows installation in Calgary. You can get great bargains on beautiful, high-quality vinyl replacement windows, and you'll save a bundle on installation, too.